The share of online Americans using any of Facebook’s sites has dropped in the last year. The % of online adults using Facebook, Instagram,or WhatsApp, as well as any of these three, is lower than one year prior. This is based on the 2018 wave of Technology User Profile (TUP), a survey of technology users now in its 36th year. Three in four online adults (76%) report having used Facebook in the prior 30 days, down from 84% in the prior year. When Facebook acquired Instagram, it looked like a solid move to give site-hopping users an alternate venue to connect and share, whilestill staying within the Facebook family. However, as the advertisements rampedup and other sites attracted interest, users became less active or left.Between 2015 and 2017, Instagram’s expansion appeared to be on track to reachat least half of online adults before 2020. However, use has shrunk from a peak42% level in 2017 to the present 38%. 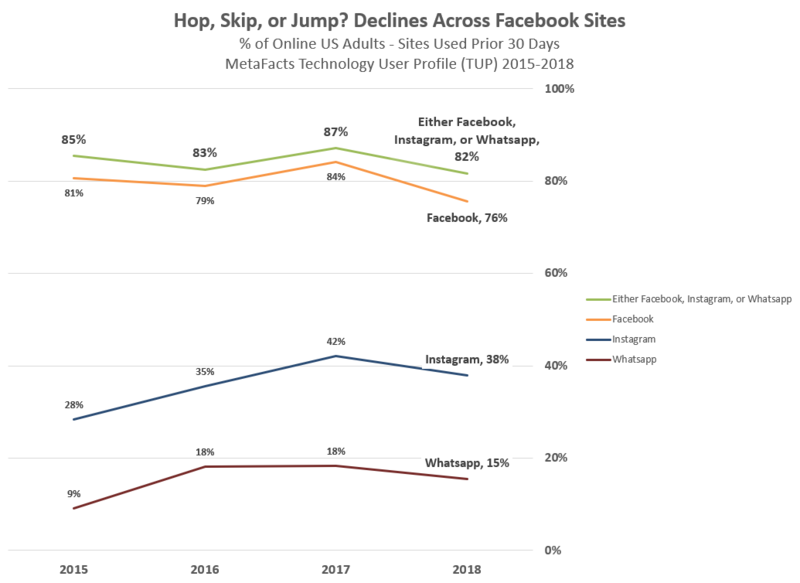 We looked at the overlap of users of any of the three sites – Facebook, Instagram, or WhatsApp – and that share has also decreased, although not as strongly. In 2017, the share of adult Americans using any of the three was 87%, and now in 2018 that share has dropped to 82%. Fickle consumers continue to express how they choose to spend their time online and offline. Although Facebook has taken many steps to weave their way into everyday experiences, users continue to explore alternatives. I’m reminded of the rises and falls we’ve seen in sites from Google+, MySpace, AOL to CompuServe and Prodigy, as network effects or following the herd entices large groups of users to move on from the market leaders.While I’m not calling this dip the beginning of another end, it is a cautionary note that Facebook has additional work ahead of them. Also, user defection isn’t the only issue facing Facebook. Advertisers and organizations reliant on Facebook can speed up any downdraft as they review any shifts in their own key numbers and consider other options. TUP clients can drill down further into these results to explore related results such as: which types of devices users use to access social networks, demographic profiles of users by social network, and details for the UK, Germany, China, and India.